So, did everyone have a happy Thanksgiving? I definitely ate my weight in food these past couple of days, I'm pretty sure. But I've been enjoying the long weekend! We went Black Friday shopping yesterday, but not until late morning/early afternoon. It was still pretty busy in the stores, but not too crazy! Today we stayed home and put up all the Christmas decor. Trent got all the lights up outside, and I put up the tree and the other holiday decor. Will have some pics up tomorrow! One thing I haven't done yet is wrap presents. Last night I put this cart together - I had picked it up at IKEA and was planning on putting it in my office upstairs. It's the Raskog utility cart. 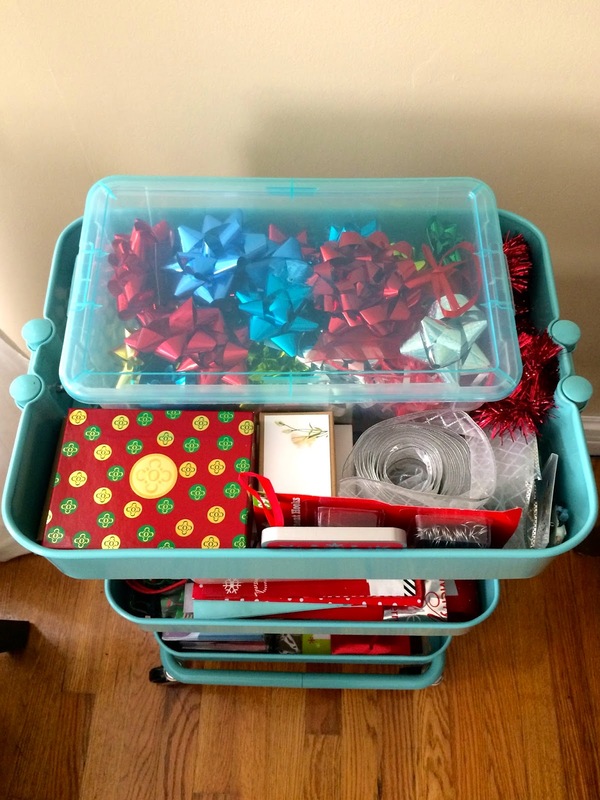 When I got home last night I had the idea that it would be perfect for gift wrapping storage! So I took all the parts out of the box they were still in, and assembled my storage cart (with a little of Trent's help!). Then I filled it with all of my gift wrapping necessities. I think it will work really well. It's much more organized. All of my bows and ribbons are in the top section, along with other little knick knacks, and small gift boxes. 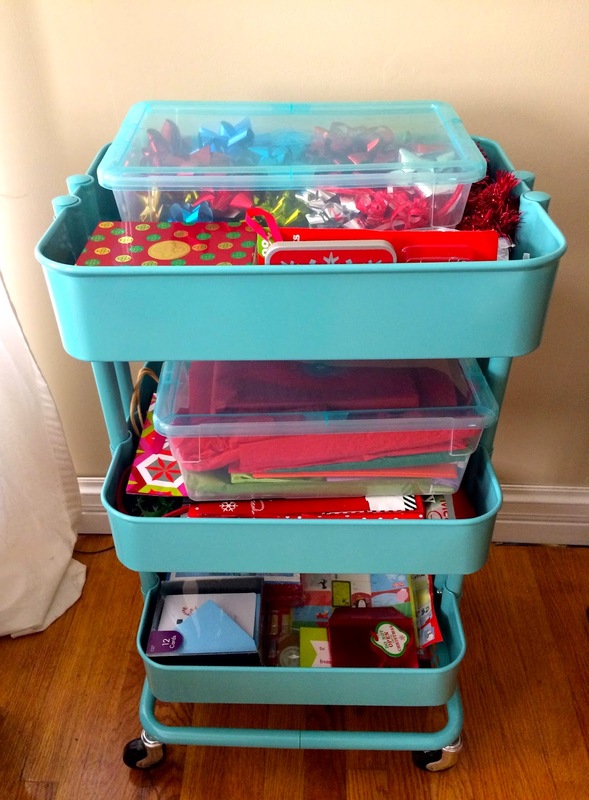 I had a few extra plastic storage containers that I had used in my office for drawing and crafting supplies, markers, etc., so those came in handy, and they match! I love them because they're clear, so there's no need for labels, since you can easily see what's inside. 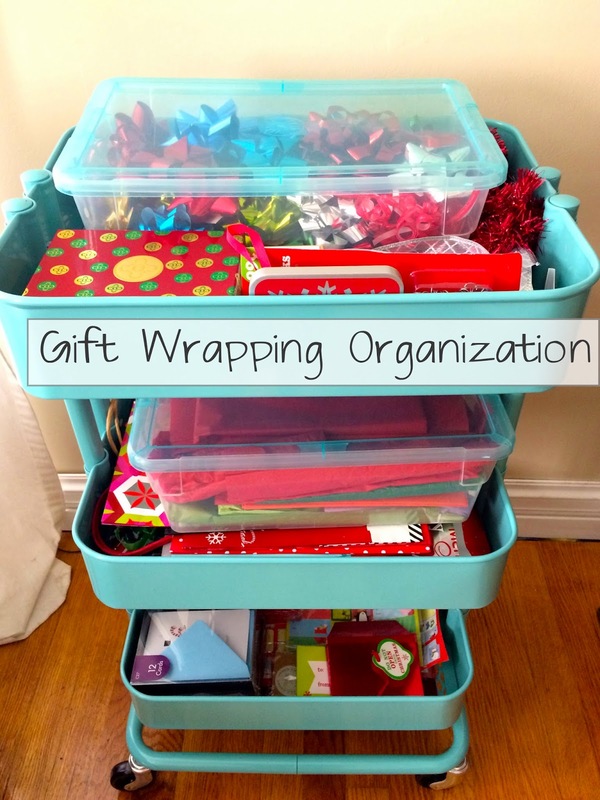 The middle section contains gift bags and tissue paper. And the bottom section has gift tags, gift card holders, and Christmas cards. The only thing missing is wrapping paper, and I'm working on a system for that! I have a long storage box that works for the smaller rolls, but I have several longer rolls that don't fit, so that's still a work in progress. Once I clear a designated spot in the closet, this cart will have a home. With the wheels on the bottom, it rolls really easily, and I will be able to roll it out whenever I need to wrap presents. And I can't wait to wrap some gifts this year now! Linked to: Say G'Day Party, Link Party Palooza.